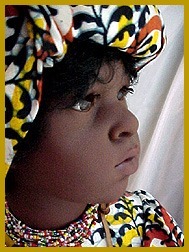 "FATOU of Gambia from NISSEN, Designer of the Original World Children! Please allow time for photos to load, she is FABULOUS and REDUCED IN PRICE too! A young girl of Gambia, a republic well known as the ancestral home of the late American author, Alex Haley and his brother George Haley, US Ambassador to The Gambia. Alex Haley's novel "Roots", adapted for a world renowned television series, placed The Gambia in the international spotlight. United Children of the World! 27 inches tall, crafted in vinyl from the original sculpt of famous mannequin designer John Nissen and costumed and finished by Else Madsen also of Denmark. A Rare and Unusual find, and less than 1,200 worldwide! SALE PRICED! 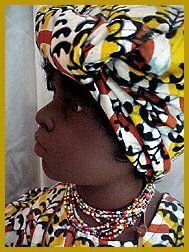 Fatou is dressed in traditional dress of Gambia with a wrap skirt and a tunic overdress and head wrap (you can see the Creole influence)! 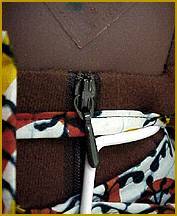 It is not uncommon to see Gambians wearing a small leather pouch around their neck, arm or waist; called gris-gris (pronounced 'gree-gree'), these amulets are thought to ward off evil or bring good luck. 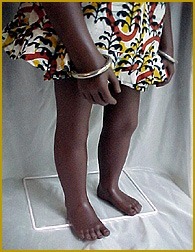 Fatou has a necklace of faux leather pouches around her neck and also colorful beads, and bangles at on her wrists. The body is hand stuffed, as you can see by the zippered back, and she comes with her own stand and a certificate of authenticity. Original Price was $379! Worth even more now as she is UNAVAILABLE! New from gallery stock in original box. 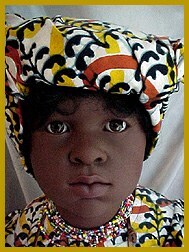 She will be shipped by UPS from Boston, MA 02116 and is approximately 8 pounds shipping weight. Buyer to pay shipping.